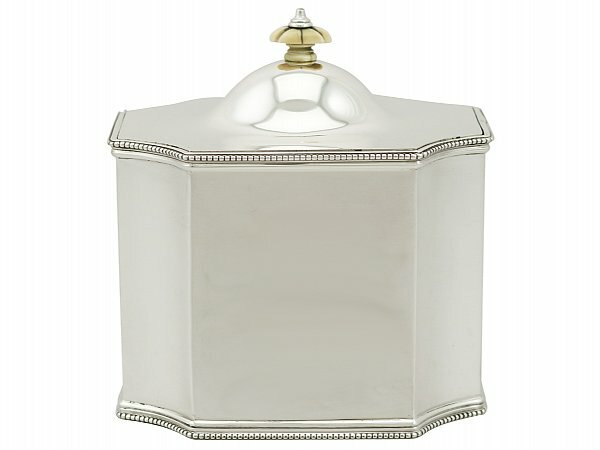 This exceptional antique George V sterling silver tea caddy has a rectangular shaped form with incurved corners. The surface of this impressive 1920's tea caddy is plain and unembellished , accented with applied bead decorated borders to the upper and lower rims. This antique sterling silver tea caddy retains the original hallmarked flush hinged cover with an applied moulded paralleling border; the flush hinge indicates the high quality of the piece. The cover is surmounted with the original ivory and silver topped finial, securing to the interior with a screw fitment. The underside of this highly desirable tea caddy bears the retailers mark 'Crichton Bros, London & New York'. 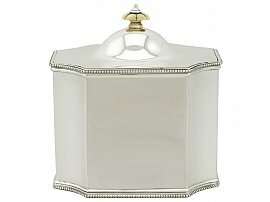 This antique 1920's tea caddy is an exceptional gauge of silver, exceptional quality and in exceptional condition. The piece has been professionally polished and is in presentation condition. Full hallmarks struck to the surface of the caddy and part hallmarks to the interior of the cover are all very clear.